Take control of your Windows Media Player 12 experience by managing its library. Media Player 12 automatically sorts through your libraries’ stash of digital music, pictures, videos, and recorded TV shows, automatically cataloging everything into Media Player’s own library. Windows Media Player 12 was built for Windows 7 and isn’t compatible with earlier versions of Windows. If you want to have access to other media files, such as those on your Windows Home Server or elsewhere on your network, you’ll want to change the way the Media Player builds its library. Open Windows Media Player 12. You can load Media Player by clicking its icon in the taskbar or by typing Media Player at the Start Menu. Click the Organize button and choose Manage Libraries from the drop-down menu. A pop-out menu opens, listing four types of media: Music, Videos, Pictures, and Recorded TV. Click the type of media that’s missing files. A window appears listing the folders monitored for that type of media. For example, the Media Player’s Music Library normally monitors the My Music folder and the Public Music folder. Click the Add button, select the folder with your files, click the Include Folder button, and click OK.
Media Player immediately begins monitoring the new folder, adding its music to the library. Repeat these steps until you’ve added all the places Media Player should search for media. To stop Media Player from monitoring a folder, follow these steps, but in Step 4, click the folder you no longer want monitored and click the Remove button. 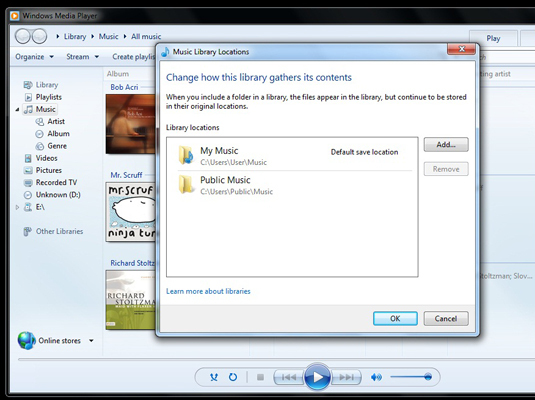 Adding played items: Anytime you play a music file on your PC or the Internet, it is added to your Media Center Library. Windows 7 doesn’t automatically add played items that live on networked PCs, USB flash drives, or memory cards. Ripped music from CD: Whenever you rip music from a CD, Media Player notices where you put it and adds it to the library. Downloaded music and video from online stores: Whenever you use Media Player to purchase music and videos, those items get added to the library. The new Media Player comes stocked with a much larger selection of codecs that allows it to recognize more types of audio and video files than Media Player 11 could.